Installing My Chemo Port – What is CLL ? During my first chemotherapy session, I didn’t have a port installed yet, which required the medication be administered intravenously in my arm. A port is a much more efficient method, and doesn’t cause the problem of diminished vein quality over repetitive, long term use. So, what exactly is this so called port ? In simple terms, a chemo port is a device that gets implanted just below the skin, and connects to a blood vessel near the heart. The port process begins with the selection of the specialist who will do the installation. This is typically done by a blood circulatory expert. My oncologyst’s normal referral partner wasn’t part of my insurance group, so he recommended one from the list of approved candidates. The procedure itself is outpatient surgery taking less than two hours. It involves a small incision in the upper chest area. In my case, the right side, although I’m not sure if it makes any difference. 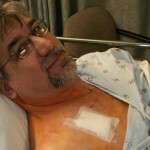 In the recovery room after my chemo port installation. During the surgery, I was well medicated floating in and out of consciousness. There was nothing painful or uncomfortable during the procedure. I was in recovery for a short time after surgery, and then allowed to go home. Over the next couple of days, I noticed a bit of itchiness around the incision, but no real discomfort or pain. It does feel weird to the touch though. The skin over the port has no feeling, and the port itself protrudes enough that it is visible under a light shirt. All in all, the whole process wasn’t much of a disruption to my normal day to day life, and will surely make things much easier during my chemo sessions. There is however, a situation that I would like to share with you about my experience with the specialist who performed this procedure. The reason I bring this up, is that I’ve mentioned many times how much confidence I have in everyone I’ve dealt with since the beginning of this journey. All involved have been responsive, courteous, and professional…. until this person. My wife contacted his office two weeks before my first chemo session to get scheduled for the port install. They were to call back later with a date for the procedure. After nearly a week, there was no return call. My wife then had to call them several times over the next week to get them to respond with a date and preliminary office visit. I had a bit of a bad feeling about this. The day of the procedure, I was prepped for surgery, and when it was time to start (7am), the doctor hadn’t arrived yet. One of the nurses said he had just called, and said he’d be there in 10 minutes. After 30 minutes passed, I became uncomfortable enough with the whole situation, that I asked the nurse point blank: “Is this guy capable of doing my surgery, because I’m not feeling good about this situation.” She assured me that he was a good surgeon, just a bit disorganized. Abut an hour later, he finally showed up. If I had it to do over again, I would have tried to find another surgeon at the first sign of doubt. In the end my port works fine, and I don’t have any issues with it so far. Since the day of the surgery, I have never heard from that doctor. I would have expected at least a follow-up to see that it was healing properly, but nothing. When it comes time to remove the port, I’ll certainly employ the services of a more professional specialist. Your post so impressive. My brother is going for chemo port in couple of days can u suggest any complication would occur ? And also let me know the precautions to be taken! Thank you for the kind words. I wish you and your sister well. Always maintain a positive outlook, no matter what. Sometimes I think it was harder for my wife than it was for me, so I understand how you feel. Thank you so much for sharing your experience with having a port installed. I have had renal cell carcinoma since 2009. I had my right kidney removed in 09 and then in 2011 a stable tumor moved into my spine and destroyed my T8 and T9 vertebrates. I had a spinal reconstruction that has left me with severe pain and some mobility issues since then. I have had several bouts with pneumonia and been hospitalized for it on five occasions. I dread all the needle sticks and am down to about one reliable vein left. Tomorrow I am scheduled to start on Zometa to help with the cancer pain in my spine and ribs. This is being done by IV infusion. I have toyed with the idea of a port for a couple of years because of the pain from being jabbed over and over, but have been a little leery of the procedure. Your post has convinced me to get a port done since this will be a monthly recurrence if it works. Thanks very much for sharing and best of luck with your battle. Glen, I’m sorry to hear of everything you’ve gone through. It sounds as though a port would be a good option for you, and I’m glad that you found this article helpful. Nick I am getting a port installed as I will be undergoing a bone marrow transplant soon . I totally understand your trepadation when surgeon was late . I had an awful experience about a year ago before and during a bone marrow biopsy and aspiration . The PA was late so my oncologist began the procedure and I don’t think he had done a bone marrow biopsy since medical school in Prague I few decades ago . The PA and my oncologist began arguing then the PA stormed off . My oncologist injected the local anesthetic which numbs the skin and muscle not the bone unfortunately he did wait long enough to have it take effect and started biopsy the long needle device was extremely painful upon insertion and the needle actually got stuck in my hip after being threaded . I swear I had an out of body experience anyway I survived but one detail they should usually remove all bloody gauze and such when I rose off table and sat up I saw a large pile of bloody gauze it made me woozy . Very rare incident and I hope I took the bullet for everyone . We have to stay positive ! How soon were you able to return to work after having the port installed? For me it was a matter of a few days. If your job required any type of physical exertion, my guess would be more like 10 days or so. Your doctor can give you the best advice there. My father was recently diagnosed with stage 4 stomach cancer. Of course the doctor suggests chemotherapy but my father has lost so much weight already( he weighs 97 lbs). His average weight is 110 usually. He feels that the chemo is going to kill him because he’s so weak and thin but has agreed to try it. I’m concerned about the metaport and the anesthesia because he’s so weak. He’s 82 years old. Any advice as to if I should be worried? They did suggest a picc line also but I don’t like the idea of that either. Any feedback would be helpful from your experience. Thank you. I just had a port put in this morning. Because I had some tea with milk in it when I got up, they were unable to give me sedation. So they put the port using local anesthesia only. I was awake for the whole thing. They just gave me an Ativan for relaxation beforehand. It was not a problem in my opinion (but it depends on the person). Hi Nick, thanks for sharing. I am having a port put in next week. Should I have someone to drive me home? I have received IVIG infusions for hypogammaglobulinemia via an IV every 6 weeks or so for the past three years. My one good vein is giving out and I am debating getting a port. I have reservations. My husband had a port installed 8 years ago for chemo and he thought it was painful. 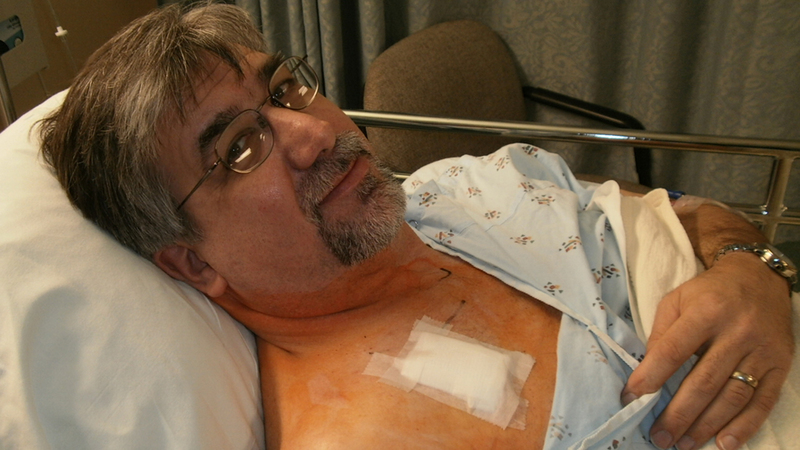 The surgeon had difficulty getting the port into place because my husband is 270 lbs and 6’3″”–a large man. Ports are made for average size people–which I am, but I am still fearful. How do I find a competent surgeon. Should I consult my husband’s oncologist? I am given infusions by an infectious disease specialist. Just wanted to tell you that your post continues to be helpful. We’re just getting started on this journey (port installed this week) and your story was encouraging. Thank you so much for writing your article. I have to have a port installed next week & I was really afraid of it. You have made it sound much more like a normal procedure. I’m sure this will be better for me as I don’t like needles in the first place. Boy I wish I had seen this post before I started all of my chemo. I was very leery when the doctor suggested a port and I thought I’ve got grapevines no big deal. Boy was I wrong. After 11 of my 12 chemo treatments I have no vines left. Sometimes they have to stick me to three Times to find a vein that will except it. If anybody has any doubt about using a port don’t. it’s the best way to do it. In hindsight I would have had a port put in in a second. I have chemo treatments every two weeks. That really puts the stress on any of your veins. Your comments about a good mental attitude are right on spot. I have a very positive outlook on life itself and with my wonderful family team and a great team of doctors I knew from the very start that this was a done deal. Thanks, Judy. I’ve been tripping since yesterday when the doctor told me I’d need a port. The nurse was so nice and empathetic, but the idea of this thing under my skin just freaked me out! Thanks for the heads-up! I would like to extend a sincere thank you to everyone who took the time to write about their own experiences with the port installation. Unfortunately I am scheduled for this procedure on Wednesday morning the 13. Besides feeling like a freight train has plummeted through my world with the news of a diagnosis of stage 3 invasive ductal carcinoma breast cancer I have been absolutely terrified of having a port and your stories have help elevate some of my fear. Thank you! I am doing my best to stay positive and know the importance of a positive attitude. I agree with the person who stated that it can be more difficult for the ones who love us for i see the concern, pain, fear and frustration of not being able to fix or protect me in my beautiful best friend, lover, husband of thirty years eyes who wont leave my side and words cannot convey how much his actions of unconditional love means to me. I look like a very healthy woman for I am in excellent shape because I am very active but on top of this ugly uninvited monster taking up residence in my body i also have graves disease on top of extremely difficult to control high blood pressure. I am sharing this info because am curious if anyone else had this port installed with high blood pressure issues and if so how did they do during and after surgery? I know everyone reacts differently but am curious to any issues if any that were concerning. Thank you again as your post have helped lessen my fears and stress. I wish the best to each and everyone and may our lives be filled with absolute positive things, wonderful health and happiness. My port is being installed in an hour and as terrifying as it may seem or as uncomfortable as it may look. The positives outdo the negatives. It’s the first step in a yearly treatment that will help save my life! Frankly, my outlook approaching this same shocking invasive cancer is…. if it’s the size of an AA battery just get it in and get going. Trusting my recovery teams research and experience, my faith and support from family and friends is one thing I’m sure of. All the best to all cancer patients! my daughter-in-law is diagnosed with breast cancer, she is 41, and the doctors are having her do Chemo first and are installing a port. I know she will do good because she has a lot of people supporting her. I wish you well in your treatments and recovery. I just finished chemo in December of 2015. I am glad to say that at my last CT scan I am cancer free. I am going to be having my port removed in the next few weeks. I found this web site for my Mom however, she was just diagnosed today with CLL. She is 81 . After having just completed chemo myself I am hoping she will not have to go through this, not sure she could handle it. The physical part is tough enough but emotionally I don’t think she is up for it. I appreciate this blog to get more information about what we as a family are about to go through… Again. The surgery itself was about 2 hours, and I was released after another 2 hours of recovery and monitoring. I had my port put In today, I know that it was the best option but I’m still a little nervous about this. Reading your stories have been informative and inspirational. Thanks for sharing. I’m glad you found my stories helpful. You notice that it’s there, but there’s no pain or discomfort after you heal from the initial surgery to put it in. I am being treated for lung cancer. After 8 infusions my veins wouldn’t cooperate. Even the ultra sound didn’t help so I agreed to a port. Already I feel better knowing of the ease the nurses will have giving me treatments. I’ve been fortunate not to have any reactions to the treatments and now with the port I’ve got a whole new attitude about this. As for pain, I had my first infusion the next day, there again, no pain or discomfort. Go for it ! I had my port put in this morning for chemo for breast cancer. I have high blood pressure and asthma but did fine with the surgery. I have a great surgeon. He also did my lumpectomy surgery back in February. No pain yet just the tape on my neck covering that incision is pulling my skin. Not hurting just pulling. I’ll be glad to get the bandages off on Thursday. I’m going back to work tomorrow and start my chemo on friday. I am petrified just thinking about the port procedure being done…Go next week to have it done.. The procedure isn’t a difficult one, and it makes any treatments so much easier. Good luck to you. I’m happy you found the information helpful. I’ve been cancer free since May of 2013. Thank you for asking. Thank you for writing this. Not much was explained about what a port is or does and while looking up info I came across this post. The information here was very helpful and informative. My husband is having one installed on Friday. Congrats on being cancer free!!!! Thank you so much for your post. I will have my port installed next week and I was very anxious. You explained it very well. I pray I have a good surgeon because I did have an incident with one I lost faith in so cancelled the surgery. I ultimately had the surgery at Cedar Sinai and it was a success. I had a 11cm tumor taken off my left lung. So glad I changed Dr’s. We have to be aware of our options and work as a team. Thanks for the post Nick. I am having a port installed soon for my chemo and I was scared to do it. Reading this post and comments I am glad I decided to do the procedure. Very good news that you are cancer free. I had a port put in today. I have history of high bp and latex allergies. I am a stage 4 with mets to the bone cancer patient. It went really quick and recovery went fine. I am sore about 6/7 still especially when I move my right arm , port side.I had severe anxiety for nothing. was quite simple but dangerous. I will do it again if necessary. Who needs more damn pain if you can avoid it. Pain can kill you. Praise God for every day he gives us. thank you so much for your information, I’m taking my brother to have a port put in for chem in the morning. this help ease my mind. God bless you. Laser scopic surgery and got diagnosed cervical cancer have to go through six months of chemo therapy I’m stil trusting in Lord…..
My best friend is having a port put in right now. It was so good to read all the info on it. You made me feel not so anxious about the whole procedure.